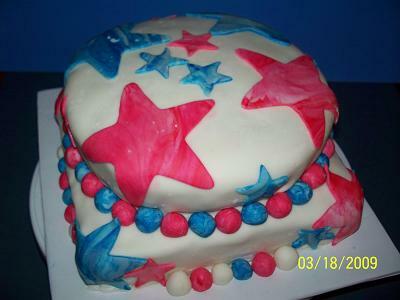 This star cake is my first time trying fondant. THANK YOU NANCY!!!!!!!!!!!!!!!!!!!!!!!!!!!!!!!!!!!!!! Nancy made some fondant and mailed it to me so I could try it!!!! What a sweetie!!!!!!! I baked a round and square - yellow cake. I iced them with buttercreme then covered them in the white fondant. I mixed in some red and blue color and did the tye-dyed effect and cut out some stars. I rolled what was left into small balls and then cut them in half and placed around the sections of the cake. I attached the balls and stars with some peppermint schnapps I had in the cabinet. This sure was an experience! Wow 1st try and yet very prof. Nice mable color.